On a warm, humid morning in late August, Kait and I drove an hour from Lansing to Battle Creek to visit a mobile food pantry. We found the location and parked a few blocks down the street, in a neighborhood that probably saw its best days about 40 years ago. Some of the homes seemed to need repairs, with a broken porch spindle here and there, and a few saggy roof lines. Still, the neighborhood had a nice feel to it. It felt cared for. Upon entering the fenced in parking lot known as “Mike’s Place”, there were already fifty or so families from the community filed in the area, huddled in semi circles, making small talk. Near the church, volunteers were busy moving food from pallets to tables, stacking bags of fresh sweet corn, cabbage, melons, breads, and other grocery items. There were smiles everywhere. Clients waiting in line smiled at each other as they chatted. Smiling volunteers passed out numbers to clients, securing their place in the food line. A volunteer from FireKeepers Casino conducted a cooking demonstration, and stood with a beaming smile. Kait and I found our way to the tent at the far corner of the lot and approached our colleagues from Food Bank of South Central Michigan. This food bank provided the food for the morning’s distribution, but they were providing an additional, vital component to the mission of hunger relief: nutrition education. Convenience style stores dapple many of Michigan’s urban neighborhoods, but rarely do they stock enough quality, affordable produce items to sustain the health of local residents. A lack of exposure to nutritious food items exacerbates the challenges that poverty creates in a community, particularly for seniors and children, particularly in health and education. Michigan food banks are committed to supporting the nutritional health of low income residents. In 2015, our network launched a pilot program which pairs nutrition education with produce at mobile distribution sites, such as this one at Mike’s Place. In its first six months, the program, Michigan Food Bank Access to Nutrition has exceeded goals both in number of pounds and people served. At the mobile distribution site, cooking demonstrations are complimented by taste tests in pre-portioned cups, recipe cards, nutrition information, and surveys. The taste test and recipe cards match the produce that is being distributed, allowing clients the opportunity to prepare the food in healthy ways when they get it home. The staff and volunteers with FBSCM have gone a step further. They created stickers for the children who bravely try the fruits and veggies in the taste test samples. Exposing children to fresh produce goes a long way in encouraging healthy food choices. 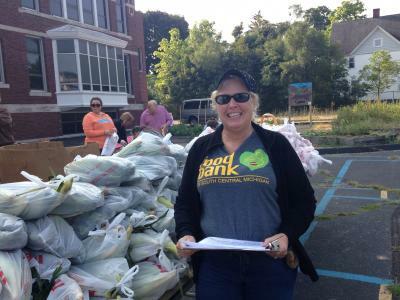 To find out more about the Michigan Food Bank Access to Nutrition program in your area, contact your regional food bank or Kait Skwir, Director of Nutrition and Outreach at Food Bank Council of Michigan, (517) 664-9904.